You are reading it right. You can double the bonus Stampin UP! is offering. For limited time only I am offering additional $5 coupon for every $50 spend. This offer available only when you place the order in my store. You will receive one coupon from Stampin Up! and one from me. Bonus Days coupon can be used August 2-31. This is a great opportunity to shop from your wish list, whether you buy your favorite products now or later in August with your coupons! 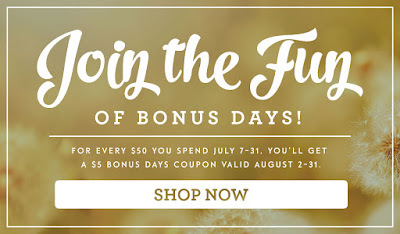 Bonus Days coupon codes can be redeemed for any product, excluding Starter Kits and Paper Pumpkin subscriptions. Visit my store. Hostess code for the month of July is CVUR79GP.